We provide high quality project management and workmanship in the sphere of garden renovations, hard landscaping and exterior building services including concrete, block paving, brick laying and block work, rendering, planting, carpentry and painting and decorating. As a small, enthusiastic team, we pride ourselves on building excellent client relationships, keeping you informed on the progress of the project every step of the way. With extensive knowledge and experience, we can guarantee an expert finish and reliable service. 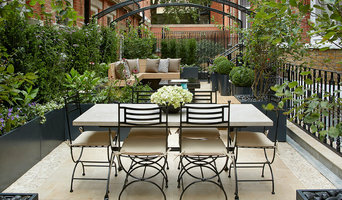 We offer comprehensive design advice on all outdoor areas, from small urban courtyards to large country gardens. Building on your brief, we will transform your external space into an attractive and peaceful garden that is sympathetic to its surroundings. CIRCLE GARDEN SELECTED BY FRENCH HOUZZ AS THEIR FAVOURITE GARDEN PROJECT IN THE BEST IN THE WORLD TOUR OF 2017! Welcome to our website. 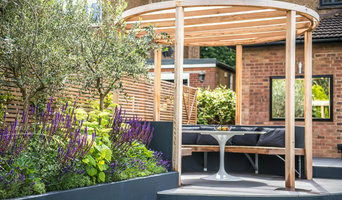 We are a small, friendly and professional award-winning garden design, planting and garden renovation company based in Harpenden, Hertfordshire. We design gardens in Harpenden, St. Albans, and the rest of Hertfordshire, along with Buckinghamshire and Bedfordshire. Green Tree Garden Design is run by me, Fiona Green. Using my eye for design; understanding of materials and construction techniques; and extensive knowledge of plants and horticulture, I am able to deliver the widest range of design and planting solutions. Supported by a fabulous team of gardeners, landscapers, and tree surgeons, I act as the primary contact for the design project, from the very first telephone call to completion of the fully planted garden, and beyond. Excellent customer relationships are key to our success, and I spend a lot of time understanding exactly what you want from your garden to ensure that the finished product fully matches your dreams. Many of our customers have become friends, and a couple have now asked me to design the garden in their new house, having moved, which is very exciting. Whether you desire a contemporary urban garden, a traditional rural garden, or any other garden style, Green Tree Garden Design can help you to achieve it. A keen gardener since childhood, I trained as a garden designer at Capel Manor College, Enfield. I now hold the RHS Certificate in Horticulture, the National Open College Networks Diploma in Garden Design, and the City and Guilds Diploma in Horticulture and Hard Landscaping. I am helped by Marcus, Alison F, Alison N, and Sarah, all of whom are experienced horticulturalists. I am a pre-registered member of the Society of Garden Designers, and works to their professional standard. We were delighted to have received the Best in Houzz 2015, 2016, 2018 and 2019 for Design, and 2016, 2018 and 2019 for Customer Service - a great honour and testament to all the hardwork, professionalism and commitment from the entire team. Karen Rogers at KR Garden Design is based in Chiswick, West London specialising in Garden and Planting Design. Karen Rogers has been designing gardens for a number of years both in West London and outside London and her designs are both stylish and elegant. In 2010 she designed a show garden for Tyrrells’ Crisps called ‘Tyrrells’ Harvest Celebration’. Her show garden was awarded a Silver Gilt Medal. In 2009 she designed a small show garden at Hampton Court Flower Show called ‘A Chef’s Kitchen’ and was awarded a Silver Medal. 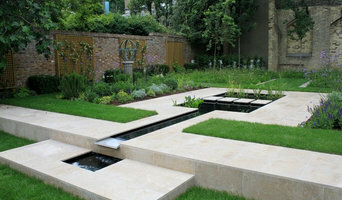 With an established practice based in Ealing, West London, I love creating stylish and practical gardens for clients. When your garden works as an extension to your house it becomes the extra room you love. I specialise in helping clients choose plants which will thrive in often less than ideal growing conditions. I skilfully select and combine plants so they suit both your style and maintenance requirements. I have a wide ranging portfolio which includes urban gardens, large rural gardens and planting schemes, wildlife reserves and school gardens. I also offer a garden restyling service, where I advise on both design and planting issues. If you would simply like to make use of my expertise, without committing to a full design project, I’m happy to make consultancy visits, supplying advice and guidance on how you can improve and develop your garden. I hope that when you have seen some of my work you‘ll feel inspired to get in touch. Azara Landscapes is an award-winning garden design and build company offering a full range of services from initial design concepts through to fully developed schemes with detailed planting and lighting plans. Once the design is complete our skilled construction team can then turn the design into reality, all finished to the highest of standards. We believe that successful garden design is both beautiful and functional, works for our clients' needs and fits effortlessly into its surroundings. By working closely with our clients, we strive to create exciting and interesting gardens, whether a small urban courtyard or a large country estate. While often using strong geometry and contemporary materials our philosophy is not to impose a design too much on an existing space. A clever use of planting allows for an interesting contrast against hard edges and creates a garden that will evolve over time and be enjoyed for years to come. Sprout Up first wriggled its way up through the fertile South London soil in 2011. After helping a few friends transform their unloved and unruly outside spaces into beautiful urban gardens, I was quickly inundated with requests from others. And as word spread, Sprout Up blossomed. Whether you need basic maintenance, some planting or a full garden design, Sprout Up is ready to lend a helping hand. My goal is to give you an outdoor space that’s both uplifting and practical. But I also want to help you develop your own gardening skills. Because the more you know about your garden, the more you’ll appreciate it. And hopefully, the more time you’ll want to spend in it. - I can work with you to teach you gardening skills on an hourly basis. - I can tell you what you have in your garden, what to get rid of and what to look after. - I can advise on where to put new garden beds and what to put in them, and if you are short of time or skills I can also do that for you. - I also offer a full design and build service, working with local contractors to a budget that suits you. Planning a garden takes more than just gardening skills, however, it also requires a certain amount of project management. Thankfully, before I started Sprout Up I worked as a television production manager, so project management comes naturally to me. I’ll work with you to make sure you’re garden project comes in on time and on budget with the minimum amount of fuss. If you think your garden space could give you more and you live in South London, give me a call and let's see what we can do. A landscape architect will handle all design, supply, construction and administrative elements of your garden or landscaping project. They will take into account your needs, the Grange Hill, Essex climate and unique advantages and constraints of the landscape architecture. Typically, work will be based on ecological and environmental considerations, and a garden will be planned not only to look its best but also to facilitate future maintenance and growth so that it continues to flourish. A Grange Hill, Essex landscape architect can also design any outdoor buildings that are to be featured in your garden. Everything from design blueprints through to the plants themselves should be provided by your Grange Hill, Essex landscape architect. If there is other architectural development taking place on your site, bring the landscape architect in as early as possible. The expertise a landscape architect can apply to understanding your space and the natural environment could be vital to planning your project. Let your Grange Hill, Essex landscape architect work closely with your architect, surveyor and any other contractors in order to develop landscape architecture that works in accordance with any other construction. This is important from a design perspective as well as on a practical level – changes to the grading of a landscape and modifications such as drainage can have serious implications on the viability of your land for extensive building and structural works. In order to resolve any planning permission issues, submit all applications for building and landscape architecture together, well ahead of the project. The scope of garden designers, or landscape gardeners, is often more limited to green space projects which will optimise your existing outdoor space rather than altering the landscape architecture as a whole. 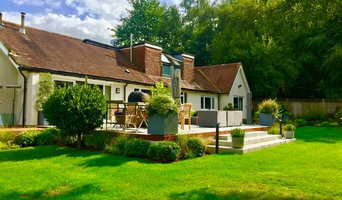 Whereas landscape architects specialise in the structural aspect of garden planning and building, garden designers in Grange Hill, Essex will carry out projects that are of aesthetic and horticultural value. Landscape gardeners will make your garden the best version of itself with features such as walkways, patios, water features, fences and lighting, as well as choosing the right plants, trees and flowers. The practical role of a garden designer may vary by firm – some offer just the plans, requiring a separate contractor, while others fulfil the project in its entirety, from conceptualisation of the landscape gardening to construction. Don’t be put off by the former if you happen to find a good Grange Hill, Essex garden designer that you like – he or she will have local industry connections to introduce you to quality, reliable gardening professionals with whom they have existing relationships. Here are some related professionals and vendors to complement the work of landscape architects & garden designers: Landscape Contractors, Garden & Landscape Supplies, Tree Services, Lawn & Sprinklers, Decks, Patios, Sheds & Summerhouses. How do I choose landscape architects or garden designers in Grange Hill, Essex? When choosing your Grange Hill, Essex garden designer or landscape architect, be sure to research their qualifications and look at examples of their previous work. A portfolio of previous landscape architecture or garden projects is important to ascertain both their credentials as well as their style. Once you have shortlisted or chosen your architect or designer, an on-site meeting is essential so they can see exactly what they’ll be working with. Stay briefed on all plans and developments, both before and during the project as a plan you approved previously may change during the course of the project. Be very clear on your budget – just like plans, costs may alter while work is underway so ensure your professional keeps you informed and does not incur additional expense without approval. If you are open-minded and budget-conscious, consider approaching new graduates keen for experience, who may negotiate a lower rate than more experienced professionals. How long have you been landscape architects or garden designers in Grange Hill, Essex? Find a landscape architect or garden designer on Houzz. Narrow your search in the Professionals section of the website to Grange Hill, Essex landscape gardeners. You can also look through Grange Hill, Essex photos to find a garden you like, then contact the garden designers in Grange Hill, Essex who worked on it.